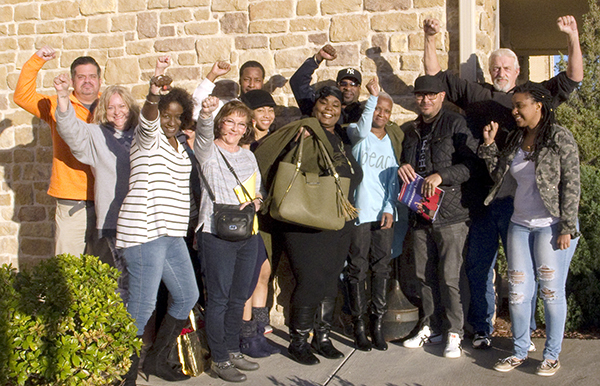 One hundred and sixty-one home-based customer service representatives who work for Frontier Communications in Texas overwhelmingly won a mail ballot election to join CWA. A strong inside organizing committee was supported by officers and activists of CWA Local 6171 and by District 6 organizing staff. The committee set up an effective network to share information and updates on a daily basis. They overcame the challenge of an all home-based workforce by reaching out and meeting agents at stores, restaurants, and at homes in addition to connecting via text, social media, and phone calls. 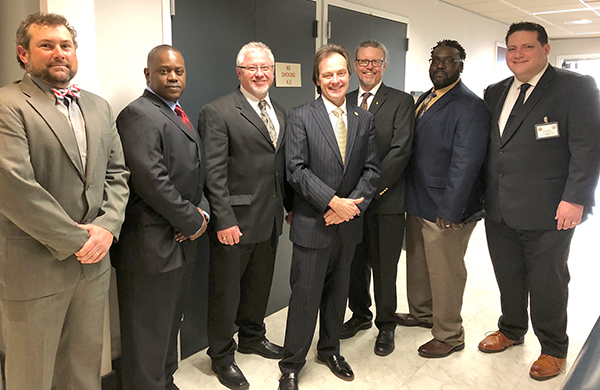 Members of Local 6171, which represents several Frontier units in District 6, were at every committee meeting to talk about how a union voice makes a difference at Frontier. Home-based customer service representatives with Frontier Communications in Texas are joining CWA. A majority of the newsroom staff of the Casper Star-Tribune, Wyoming's statewide newspaper, filed cards with the National Labor Relations Board on Monday, starting the process of forming a union. "Organizing the newsroom is our way – as journalists dedicated to the communities we cover – to strengthen local control over Wyoming's largest media organization," the Casper News Guild said in a statement. 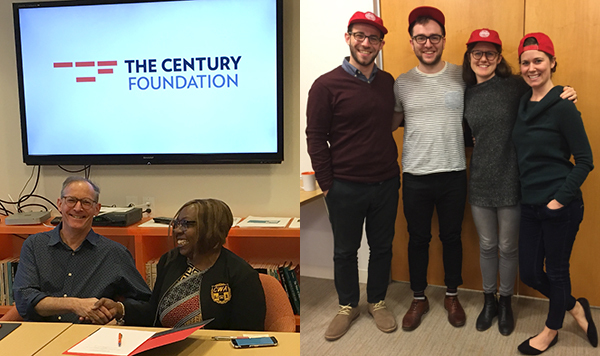 After 10 months of bargaining, staff members at the Century Foundation, a nonprofit, progressive public policy think tank, signed a first-ever collective bargaining agreement with the employer. Since voluntarily recognizing union membership in March 2017, the staff union and TCF have worked closely together to reach an agreement that recognizes the important work and critical value of TCF's staff, and builds on a mutual deep commitment to collective bargaining rights, fairness, and respect in the workplace. Left: CWA Local 1180 First Vice President Gina Strickland with TCF President Mark Zuckerman, after signing the new contract. Right: New members (L-R) Casey Berkovitz, Sam Adler-Bell, Lily Hindy, and Mariel Iezzoni. 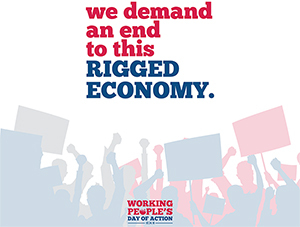 On February 24, in cities across the country, thousands of working people will unite to demand an end to an economy that's rigged in favor of the wealthiest and most powerful. In late February, the Supreme Court will hear Janus v. AFSCME Council 31. This case is the culmination of decades of attacks on working people by corporate CEOs, the wealthiest 1%, and the politicians that do their bidding to rig the economy in their favor. The forces behind it simply do not believe that working people should have the same freedoms and opportunities as they do. Enough is enough. By sticking together, we can defend our freedoms and demand an end to the rigged economy. Join our Working People's Day of Action on February 24! As Dr. King told striking sanitation workers in Memphis fifty years ago, "Freedom is not something that is voluntarily given by the oppressor. It is something that must be demanded by the oppressed." Learn more and sign up to be part of the day of action here! Members of UPTE-CWA Local 9119 held informational pickets at University of California (UC) campuses across the state to call for fair wages, benefits, and working conditions at UC. Members of UPTE-CWA Local 9119 held informational pickets at University of California (UC) campuses across the state with a 50,000-strong coalition including AFSCME Local 3299 and the California Nurses Association to call for fair wages, benefits, and working conditions at UC. UC has rejected demands for raises that keep up with the cost of living, market-competitive salaries, protecting pensions, and affordable benefits. The solidarity actions sent a message to UC that our unions want fair wages, benefits, and working conditions for all. 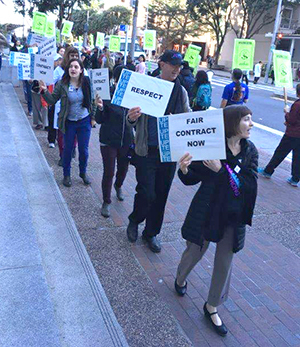 "Working without a contract ruins morale," said Anita Nuechterlein, a Clinical Lab Scientist at UCSF and a member of UPTE. "If we don't see results from UC, if we don't see UC respond and show us respect, the younger generation will be leaving and UC will be left without workers. The patients will suffer, and the community will suffer, and it will be a horrible mess. I do not want to see that. It makes me very angry and upset to see that we have to fight this hard just to be able to take care of ourselves and do our jobs." CWA's push to pass legislation to protect U.S. call center jobs and crack down on U.S. companies that offshore their call center jobs is gaining momentum across the country. Michael Schendel, president of CWA Local 37083, spoke in favor of the Washington Call Center Jobs Act (HB 2844). 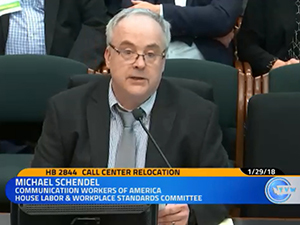 In testimony delivered this week before the Washington House Labor & Workplace Standards Committee, Michael Schendel, president of CWA Local 37083, issued a strong endorsement of the new Washington Call Center Jobs Act (HB 2844). Recognizing how the continued offshoring of call center jobs to lower wage countries has harmed working families, communities, and consumer security, the legislation would add new levels of accountability to the offshoring process and ensure that taxpayer dollars are not rewarding companies who are actively eliminating and offshoring jobs. 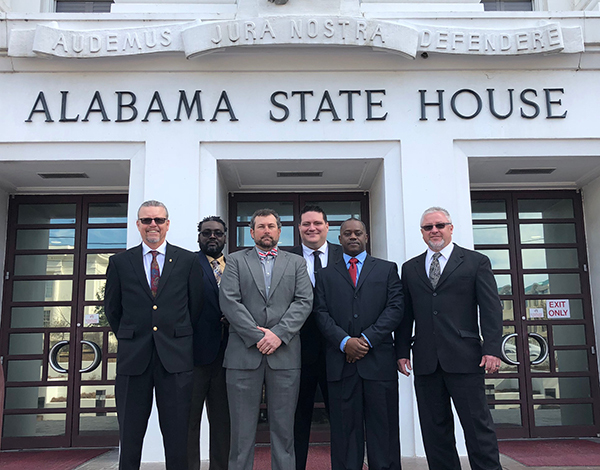 CWA Local Presidents pushed for Alabama call center legislation during a Lobby Day visit to the Alabama Legislature in Montgomery, Ala.
Front of building, left to right: Keith Patterson, Local 3908 President; Ra-Amon Ta-Neter, Local 3907 President; Bruce Hembree, Local 3909 President; Jason James, Alabama LPAT Coordinator; Isa Shabazz, D3 Alabama Staff Rep.; and Danny McDuffie, Local 3904 President. Center: Rep. Phil Williams (R-Huntsville) is sponsoring a house bill to protect call center jobs in Alabama. With the support of CWA and other labor unions, U.S. Senators Bernie Sanders, Elizabeth Warren, Kirsten Gillibrand, Edward Markey, Jeff Merkley, and Mazie Hirono wrote a letter to President Trump calling on him to renegotiate NAFTA in a way that eliminates incentives for companies to offshore jobs, strengthens labor protections, and protects consumers. "Millions of Americans haven’t seen a pay increase in years and can’t find better paying jobs due in large part to unfair trade deals like NAFTA," the Senators wrote. "Instead of leveling the playing field, NAFTA makes it easier for companies to outsource jobs to Mexico so they can pay employees less and pollute more. Since NAFTA's implementation, Mexico's already low manufacturing wages are down 9 percent in real terms and U.S. wages are flat, while the price of everything from childcare to housing to a college education has risen. Unless we rewrite NAFTA, it will keep giving the green light to corporations to outsource American jobs, pushing down wages for middle class and working families." A renegotiated NAFTA should include protections for U.S. workers who saw a flood of jobs move south of the border in the 25 years since the trade agreement between Mexico, Canada and the U.S. was approved, said U.S. Sen. Sherrod Brown, D-Ohio. "So many working families have not seen a raise in the last decade. To me it's all about how do you write a trade agreement and how do you write tax policy that helps to increase wages, not push wages down," Brown said during an appearance at the United Autoworkers Local 696 headquarters in Dayton on Friday. Sen. Sherrod Brown, Tyra Williams from IUE-CWA Local 84755, retired UAW worker Rick McKiddy, and IUE-CWA Local 84755 President, Carl Kennebrew (right), discuss how to fix NAFTA. NewsGuild-CWA and NABET-CWA are praising a bill filed Monday that would address a critical workplace safety concern by making it a federal crime to assault a journalist. The Journalist Protection Act, introduced by Rep. Eric Swalwell of California, addresses a real need, said NewsGuild President Bernie Lunzer. "This is a dangerous time to be a journalist," Lunzer said. "At least 44 reporters were physically attacked in the U.S. last year and angry rhetoric that demonizes reporters persists. The Journalist Protection Act deserves the support of everyone who believes our democracy depends on a free and vibrant press." Charlie Braico, president of NABET-CWA, said NABET's members are "easy and tempting prey for anti-media extremists and thieves" because they often work in the field alone or with just one other person. They also carry equipment that's expensive and cumbersome, he said. "The Journalist Protection Act will permit the authorities to properly punish people who attempt to interfere with our members as they work in dynamic and challenging newsgathering situations," Braico said. The Fiscal Board of Puerto Rico just released a letter calling for extreme and unnecessary reductions in protections for working people in Puerto Rico. Last year, Governor Ricardo Rosselló spearheaded an effort to reduce benefits in the private sector, a reduction that has not created the jobs that the Governor promised, but instead has created hardships for thousands of Puerto Ricans. Now, the Fiscal Board wants to make Puerto Rico an at-will employment jurisdiction and eliminate all sick pay, vacation, and bonuses. The Fiscal Board was imposed by Congress, and its members are not democratically elected or representatives of the people of Puerto Rico – they represent Wall Street interests. "As Puerto Rico faces enormous challenges rebuilding from Hurricanes Irma and Maria, CWA members will be fighting on the front lines against this awful plan to destroy our labor rights and gains with no guarantee of better and good paying jobs," said Luis M. Benitez Burgos, president of CWA Local 3010. The D.C. City Council voted unanimously this week to pass the Fair Elections Act. The bill puts democracy back in the hands of everyday voters by matching $5 for every $1 contributed to candidates who agree to only accept small contributions. The bill will help make sure D.C. elected officials are accountable to working people – not mega-donors and corporations. Instead of cozying up to wealthy donors and special interests to bankroll their campaigns, candidates who participate in the program will connect with neighborhood voters to find out what issues are most important to them and win support.